Cleveland Mayor: "We Expect More Confrontations"
Iowans for Medical Marijuana's Carl Olsen has put nearly ten years of tireless effort into an attempt to "get the state [...] to recognize the potential medical benefits of the drug," according to an August 1, 2009 Mason City Globe Gazette article ("Medical Marijuana Proponents Optimistic"). Olsen may finally see some tangible benefit from his hard work when the Iowa Board of Pharmacy holds public hearings on medicinal marijuana legalization over the next few months. Although the story popped up frequently in newspapers and on websites in late June and early August of 2009, Olsen's struggle is more than simply a current event. Moreover, the activist hopes his work will represent one small step toward federal rescheduling of marijuana, paving the way for federal medicinal cannabis programs. On May 12, 2008, Olsen petitioned the DEA in an attempt to have the Administration remove marijuana from Schedule I, a designation reserved for substances with "a high potential for abuse," "no currently accepted medical use in treatment in the United States," and "a lack of accepted safety for use of the drug [...] under medical supervision." Olsen argued that (at the time) twelve states recognized the medicinal properties of marijuana and "accept[ed] the safety of marijuana for medical use," citing several state laws and court cases - including a 1988 DEA petition of which Olsen was a part, In the Matter of Marijuana Rescheduling. As the petition states, "Because marijuana now has currently accepted medical use in 12 states, because federal law defines accepted medical use to be whatever the states say it is, and because the DEA's own Administrative Law Judge has already determined that marijuana is safe for use under medical supervision, the federal definition for a schedule I controlled substance [...] no longer applies to marijuana and federal law must be amended to reflect those changes." Although Olsen received a letter on June 25, 2008 informing him that his "petition complies procedurally" with all related requirements and "the DEA is therefore accepting the petition for filing," by December 19, 2008, the DEA had made its predictable final decision: the Administration's Deputy Administrator wrote that, "for reasons stated herein, [...] the grounds upon which you rely are not sufficient to justify the initiation of proceedings forthe removal of marijuana from schedule I of the [Controlled Substances Act]." In short, the DEA remained unconvinced by Olsen's arguments and kept marijuana in its previous and still current schedule. Olsen attempted to reverse the decision through further litigation but was unsuccessful. In late April of 2009, the federal government again denied the activist's opposition filings. Luckily for Olsen, on the same day he petitioned the federal government to reschedule marijuana, he also filed a similar petition with the state of Iowa. This time, his petition produced results. According to a July 15, 2009 article in the Iowa Independent, "In April, a Polk County judge ordered the Board of Pharmacy to at least consider whether marijuana has any accepted medical uses" after it "ruled that it did not have enough evidence to reclassify marijuana" the month prior ("Pharmacy Board to Discuss Medical Marijuana"). The Iowa Board of Pharmacy will hold four hearings over the next four months during which they "examine current science and medical findings and listen to testimony from doctors and patients" regarding cannabis' medicinal properties; additionally, the board "will look at federal and state drug laws, including those in states that allow marijuana use for medical treatment." While Iowa's pharmacy board "doesn't have the power to legalize marijuana for medical use," its members "could suggest lawmakers move it to the Schedule II category for drugs that have accepted medical uses in the United States." Olsen hopes for "a ruling that marijuana has accepted medical use in treatment in the United States and a letter from the state of Iowa telling the DEA to remove it from federal Schedule I," which would make it the first state to do so. Oddly, though Olsen argues that because "more than a dozen states allow medical use of" marijuana it "no longer meets [the] definition" of a schedule I drug, the "board initially found accepted medical use in 12 states was not enough, and the drug would have to be used for treatment in all states for Iowa to reclassify it." Olsen balks at this circular logic. As he stated in an email to Common Sense for Drug Policy, "I filed a petition with the Board of Pharmacy challenging the Schedule I classification of marijuana. The Board of Pharmacy was not able to explain why it rejected my petition[,] and the court sent the case back to them to explain why they had rejected it." However, the ever-consistent pharmacy board "made the exact same ruling again, but this time they said accepted medical use of marijuana means accepted in all 50 states. [...] That means if 49 states said it had accepted medical use, Iowa would say it has no accepted medical use in treatment in the United States until Iowa says it does. That doesn't make sense." Olsen explains that the board's rejection of his arguments resulted from the statute's phrasing. Whereas the "Iowa Legislature could have written the statute to say 'accepted medical use in Iowa,'" instead the statute reads "accepted medical use in the United States." As Olsen asserts, "In the United States means anywhere in the United States, not everywhere." Sensible English speakers everywhere may be nodding their heads in agreement, but the pharmacy board feels it has more to consider. Thus the August 19, September 2, October 7, and November 4 hearing dates, listed with locations and times below. Olsen feels relatively optimistic about the upcoming hearings, with good reason. Not only is Olsen a capable litigator himself, having filed numerous documents in both state and federal cases addressing this and related issues, but he has the support of both the ACLU of Iowa and Iowa Democratic Party. Moreover, Olsen maintains his own blog, hosts a show called Carl's Cannabis Corner on MacsWorldLive.com every Saturday between noon and 2:00 pm, has "been interviewed by every TV station in Iowa in the past couple of weeks," and secured coverage of his issue in "most of the newspapers" and at least one local radio station. Medical marijuana advocates who live in or around Iowa and would like to show their support for Olsen's efforts should attend the following Iowa Board of Pharmacy Hearings: *August 19, 2009 - Iowa State Historical Building in Des Moines from 10 a.m. and 7 p.m. *September 2, 2009 - Music Man Square in Mason City, IA from 10 a.m. to 7 p.m. *October 7, 2009 - Bowen Science Building on the University of Iowa Campus in Iowa City from noon to 7 p.m. *November 4, 2009 - Harrah's Council Bluffs, Ballroom 1 in Council Bluffs, IA between 10 a.m. and 7 p.m. For more information, visit Olsen's above-linked blog, which catalogs the majority of the media coverage he has secured and provides channels through which to view his show's weekly episodes. The El Paso Times reported on July 17, 2009 that the eponymous city will hold a free conference, titled "The U.S. War on Drugs 1969-2009," beginning September 20 and ending September 22 at the University of Texas at El Paso ("Drug-War Forum Planned in El Paso"). Among the conference's organizers sits City Council Rep. Beto O'Rourke, who spearheaded a January 2009 attempt to adopt "a resolution asking the federal government to have an open discussion on the merits of legalizing drugs." O'Rourke's idea was quashed by Texas' U.S. Representative Silvestre Reyes, who cited bad timing when he vetoed the resolution due to concerns that "El Paso would lose federal and state money should it continue insisting that legalization is a debatable solution to illegal drug trade violence," according to a press release issued by Law Enforcement Against Prohibition (LEAP) on January 14, 2009 ("Congress Threatens El Paso Over Drug Legalization Debate"). At that time, O'Rourke lamented that "it is 'a sad day in America when you're threatened if you want to have an open and honest debate about an issue that affects your community." However, according to Reyes, times have changed. The representative told the Times that "he was working to make sure nationwide policymakers attend the conference" and had "recently sent a letter to several high-ranking officials asking them to attend." For his part, O'Rourke stated that "any national policy changes on the war on drugs needed to start in El Paso," as, in his words, "The war on drugs is affecting us arguably more than any other community in the U.S., given what is happening in Juarez." This September, the Council Rep. will finally get as well as involve himself in the discussion he and a sizeable portion of his colleagues fought arduously for nearly a year ago. The only sad news in this story is that it took so long to happen. On May 7, 2009, as TampaBay.com reports, Florida Governor Charlie Crist signed into law a bill that requires "[l]aw enforcement agencies across [the state] to create guidelines for the use of confidential informants." The bill, named "Rachel's Law" after a 23-year-old graduate of Florida State University - Rachel Hoffman - "who was murdered while on an undercover drug buy for Tallahassee police" the preceding year, "calls on agencies to take into account a person's age and maturity, emotional state and the level of risk a mission would entail. Police also would be barred from promising an informer more lenient treatment; only prosecutors and judges can do that." Although legislators sapped the bill of "several provisions Hoffman's parents" - who initially pushed the proposal - "said could have prevented their daughter's death," her father, Irv Hoffman called the day of the bill's signing "a great day for Rachel's cause and memory," coming as it did on the first anniversary of her death. Thus, in spite of lawmakers' successful attempts to water down the legislation, its passage marks an important step not just for informant reform but for community- and family-based activism; the Hoffman's success shows just what a committed group of people can accomplish with some hard work and a sympathetic issue. To read more about the Hoffman case and "Rachel's Law," visit the Drug War Chronicle's May 1, 2009 piece on the issue, which provides a detailed history of the incident as well as links to older articles written while the story was still developing. In October of 2008, the Kanawha County (WV) School Board voted to implement a random, suspicionless drug testing policy for all teachers and other school employees, despite their already-established suspicion-based testing program and "being warned ahead of time that the county was in for a costly and probably futile legal battle if it approved the policy," according to a January 1, 2009 Drug War Chronicle report ("Federal Judge Rejects West Virginia School Board's Random Tests of Teachers"). And, indeed, Kanawha officials should have heeded that warning. The Chronicle states that "The West Virginia chapter of the American Federation of Teachers filed suit to block the policy" in late November, and approximately a month later the ACLU's Drug Law Reform Project and West Virginia chapter "joined the fray." In January 2009, "US District Judge Robert Goodwin said the plan would force teachers to submit to an unjustified and unconstitutional search;" he thus struck down the policy in a sweeping victory for Kanawha's school employees and possibly teachers in other jurisdictions (such as Hawaii) that are still considering such policies. In Hawai'i, controversy has arisen over the refusal by the state's teachers to submit to drug testing. The state alleges that a contract recently agreed to by the state and the union called for imposition of random drug testing. The union argues that suspicion-less testing is unconstitutional at the state and federal level and cannot be legally implemented. The Honolulu Advertiser reported on Aug. 6, 2008 ("Hawai'i Teachers' Union Reneging on Drug Testing, State Says") that "State officials blasted the public school teachers union yesterday for attempting to renege on its agreement to accept random drug testing. The Hawaii State Teachers Association agreed to a new contract in June 2007 that included pay increases and random drug testing. After getting most of the pay increases, the union has fought attempts to implement the drug testing." According to the Advertiser, "On July 18, the state filed a complaint with the Hawai'i Labor Relations Board against the union, alleging the union has failed to negotiate the terms of the testing program in good faith. The complaint was filed in response to a July 17 letter in which the union said it has learned, since the contract was signed, that random testing is not consistent with state and federal constitutions. The union has filed a petition asking the Hawai'i Labor Relations Board to make a declaratory ruling on the legality of a random drug testing program for teachers. 'Today, both parties know much more about the legal issues surrounding drug testing that were not known at the time of the initial agreement,' HSTA Executive Director Mike McCartney wrote in a letter to DOE Superintendent Pat Hamamoto. 'We cannot knowingly agree to procedures that violate the state and federal constitutions. Any agreement of this type would subject the state and all of us to unnecessary litigation,' McCartney wrote." The Advertiser noted that "The new contract included pay increases of up to 11 percent over 18 months, most of which already have taken effect.The contract called for the Board of Education and the teachers union to 'establish a reasonable suspicion and random drug and alcohol testing procedures applicable to all Bargaining Unit 5 ( teachers ) ... and implement such plan no later than June 30, 2008.'" The city of Cleveland, OH, is bracing for the possibility of heightened violence as its mayor, Frank Jackson, announces a crackdown by law enforcement. The Cleveland Plain Dealer reported on Jan. 10, 2008 ( "Cleveland Mayor Frank Jackson Expects Crackdown to Result in Violence") that "Jackson told the police this week to be more aggressive in targeting gun-toting drug dealers. He has said repeatedly that he expects there to be violent, perhaps deadly, run-ins between police and criminals. 'This is not a game,' Jackson said Wednesday. 'People are killing each other. We expect more confrontations.' At least one local defense lawyer worries that the cornerstone of Jackson's plan -- pairing police with federal agents to seek out and confront criminals carrying guns -- will result in police indiscriminately going after young black men. 'What troubled me is the idea that police officers can tell who is concealing a weapon,' said defense attorney Terry Gilbert, who has sued several police officers over the years, claiming they violated people's civil rights." According to the Plain Dealer, "Jackson officially announced his plan at a City Hall news conference Wednesday. It comes as the city's homicide total hit a 13-year high last year. Undercover police and federal agents will do nearly daily stings, observing people in high-crime areas. If they suspect the people are carrying guns, the undercover officers will call in patrol officers who will approach the suspects and ask if they are carrying weapons. Jackson and Police Chief Michael McGrath acknowledged that most of these operations will occur on the predominantly black East Side, but denied suggestions that the gun stings will result in racial profiling. Certain areas will be targeted based on crime statistics. " The Plain Dealer noted that "Two councilmen applauded the plan, but warned that Jackson has much work to do in selling it to the black community. Councilman Kevin Conwell said the relationship between some black residents and the police has become adversarial. 'They see them just like a military force,' said Conwell, who leads council's Public Safety Committee. 'If you bring in a military force, you better have a relationship with the community.'" The City of Hartford, CT, which co-sponsored a conference on illicit drug control policy in October 2005, has issued a White Paper to follow up on the event. Following is a summary. "The conference 'Illicit Drugs: Burden and Policy' sponsored by the City of Hartford, held at Trinity College and underwritten by the Aetna Foundation, provided a unique opportunity for multiple stakeholders to begin a dialogue around the problem of drugs in our city. Law enforcement officers on a local, state, and national level met with advocates of change as well as ordinary citizens. Participants reflected on the implications of illicit drug use, the 'drug war' and societal needs for treatment, rehabilitation, recovery and re-integration of illicit drug users into useful and selfgratifying roles. "The 'drug war', officially waged for nearly 35 years and unofficially for much longer, has not produced results that satisfy most citizens and analysts. Drugs remain a significant problem at all levels of society, across ethnic, racial, economic, and educational lines. Drugs are cheaper, of higher (though not consistent) quality and more accessible  especially to the very young. Research data strongly suggest that traditional prevention models (such as Drug Abuse Resistance Education or D.A.R.E.) do not have long term success and in fact may be less successful. Treatment beds are in short supply and supervised treatment programs are lacking in adequate numbers and funds. Coordination between the Department of Corrections (DOC) and post-incarceration programs, though much improved, is still inadequate to meet the demand. "A shocking percentage of people are imprisoned in our country the United States has the highest per capita prison population in the world  for non-violent, drug related offenses. Although the proportion of our citizens using illegal drugs is spread across all segments of society, a vast majority of those imprisoned for drug related crimes are the poor and the minority populations. Citizens released from prisons having served their time for drug related offenses carry the stigma of �drug felon,� limiting their ability to find work, obtain a mortgage, or receive federal college loans. Children are being lured or coerced from school to the streets to participate in a drug economy, which offers an (unrealistic) opportunity to become rich. The double problem of the addicted citizen and the crime-related economy supporting that addiction imposes a cost on society which must be paid using the same resources needed for improving education, public safety and quality of life. As a result, a small segment of society is holding the remainder hostage in an environment of danger, fear, low educational attainment, and low job opportunities. "At the conference we learned that about $50 billion is spent (mostly for interdiction) by federal, state and local agencies ($20 billion by federal agencies) on the various aspects of waging the drug war while another $165-200 billion exchanges hands in the criminal drug economy nationwide. By extrapolation on a per capita basis, that would suggest these efforts cost Connecticut taxpayers $1.5-2.0 billion/year. Even if a way were found to divert some of these funds to a better system of dealing with drug use and addiction, no one at the conference was able, for instance, to say what the cost of establishing an effective, flexible, personal treatment program of appropriate dimensions would cost here in Connecticut. The figure in other states has been described at $6,000/yr. Compare this to an average cost per year of over $30,000 for incarcerating a person in Connecticut. "Most people involved in the conference believe we could do better than the present drug policy. Recognizing that law enforcement officials are given the difficult and often dangerous job of carrying out policy they have not authored, participants said that ways should be explored to foster collaboration so police are more fully invested in the policies and enforcement methods. Attendees believed initial steps should be taken now and conversation over additional steps could begin simultaneously. Those initial steps could be advocated in concert with groups already active in drug policy legislative initiatives." 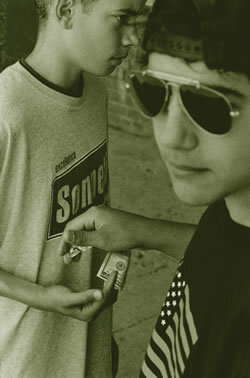 It was announced in late October 2005 that "the Federal Reserve Bank of Minneapolis has decided to ask the following question for its 2005�2006 Student Essay Contest: 'What economic lessons can be drawn from this picture of an illegal drug deal?'" "Potential profits from selling drugs have led to violent crime in America�s inner cities and elsewhere, causing some to ask whether there is a better way to address the problem. Some have proposed tougher enforcement. Others have suggested moving away from a criminal law strategy toward a public health approach, and still others have proposed legalizing drugs altogether. "These are emotionally charged and controversial issues, but perhaps by taking the cool view of an economist we can gain some perspective. Fundamental concepts, such as externalities, cost-benefit analysis and black market economics, can shed light on policies and individual behavior related to illegal drugs." Student essay deadline is March 24, 2006. Click here for more information about the Minneapolis Fed's student essay contest. Also, read this article from the Minneapolis Star Tribune on Oct. 22, 2005, "Not Your Typical Essay Contest: 3 Pages On Cash, Drugs, Crime". Exit Strategy for the War on Drugs: Toward a New Legal Framework  the King County Bar Association Drug Policy Project 2005 Conference will be held December 1st & 2nd, 2005, at the Red Lion Hotel, Downtown Seattle. Join public officials, drug policy experts and scholars from around the world to discuss a workable alternative to drug prohibition. Registration begins Nov. 1, 2005. Click here for a conference flyer. For more information or to reserve a spot, please contact Isela Gutiérrez at iselag @ kcba.org or call 206-267-7001.